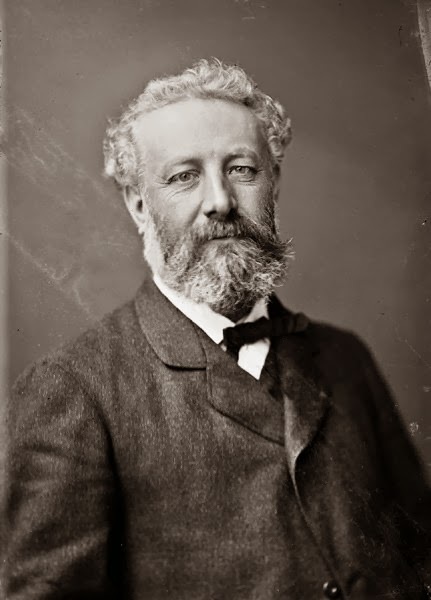 My husband and Jules Verne share a birthday, which makes sense, because he's about the most Jules-Verne-esque modern man on the planet. Not only do they look rather similar -- more on that in a minute -- but my guy has a giant brain for science fiction. Ask about an obscure novelette published in 1798 or the third episode of "Star Trek: The Next Generation" and he'll launch into the novelette's themes or why Captain Picard made the chancy choice to enter the worm hole. But I stumped him, a little, on the way home from the movies tonight. We saw "Her" and I got to thinking about fictional works set in the Gentle Future. A future that isn't especially dramatic or war-torn or dystopian or full of spaceships but rather where the people are almost like us, only with ridiculous technology. He pondered and pitched a few books and movies, but we kept hemming and hawing. "Robot and Frank," a film we saw a few weeks back, fits a bit, but naming a dozen works where the future looks like now, but with more screens, is challenging. Seen "Her" yet? The main character lives in Beverly Wilshire City Tower, in future LA, and across from One Wilshire, a real building. Lots of love for Wilshire Boulevard in this quirky flick. What will The Wilfair Hotel look like in the year "Her" is set in? It might glow or taste like cake, if you lick it. I've said before that "Wilfair" is set in the alternate now, but it has some gently futuristic aspects. Monitethers and advanced buildings and everyday objects that act as technological tools. Gentle Future is a sub-genre I like, clearly, though not nearly as much as Wisecracking in the Face of Wonder. And now, Jules Verne and Chris. He doesn't try to look like his 19th-century birthday sharer, and yet, it can't be helped. The modern man looks rather stern here, courtesy of his Medusa hair, but trust: He's merry, indeed. My guy is drawn so often by people, out of the blue, that we have a great collection of sketches. 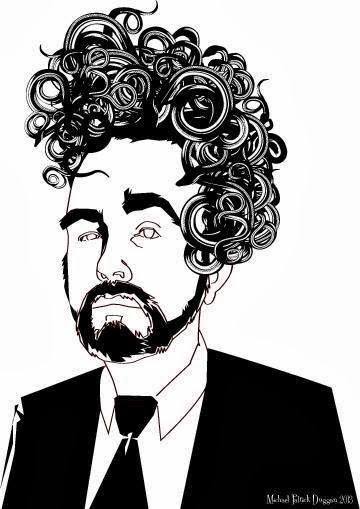 It's his remarkable gravity-defying hair, in large part. I call it the third person in our marriage. "Her" is on my to-see list, but I liked their clear little credit card cell phones in "Robot and Frank." I've meant to ask you multiple times if monitethers are a thing I should know about or not. Have you seen the thing where they matched portraits of David Lynch's hair to famous works of art? Chris' sketch reminded me of that. I've got to look that thing up. Thanks for the rec.